It’s been a while. My last post was in November 3. Actually there’s one more unpublished post in December about “Sustain” Myth and Science but I need more time to do tests and analysis, so that will have to be posted later. The project is very active, thanks to help from some folks. I am having loads of fun testing the prototype. The guitar sings and weeps like no other. There are two more prototypes underway and the development is now focusing on production. We’ll have more on that later. Now, it’s about time to continue documentation. Binding the guitar using stainless steel proved to be very tricky. This is the first time I used stainless steel as binding material. Plastic is very easy to handle. Stainless steel is many times more difficult. No wonder no one is using this for binding. But the end result is gorgeous and it is all worth the extra effort (image at right). The first issue was determining the gauge to use. Plastic binding generally ranges in width from 1.5 mm (~0.060″) to 2mm (~0.090″). 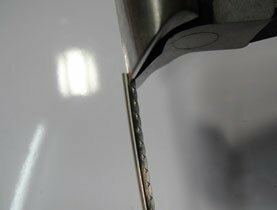 At 1 mm, stainless steel is very difficult to bend into form. At 2mm, I’ll need a press to force the material into shape. One thing for sure is that I need to improve on metal working skills. For now, I settled for 0.5 mm stainless steel sheets. 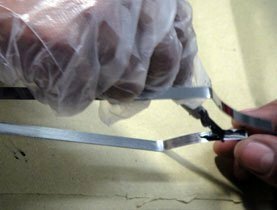 Cutting the stainless steel sheets into strips is another matter. Forget about manually cutting stainless steel sheet into 6mm (my desired binding height) strips. I tried, but can’t do it cleanly and quickly. In the end, I settled for either laser cutting or water jet cutting. Both have drawbacks. 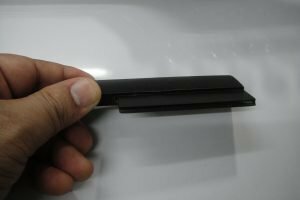 With water jet, the edges are somewhat serrated with micro cut marks that need to be filed smooth. Laser on the other hand, can’t cut long and thin strips without micro bridges at intervals to hold the sheet into place. 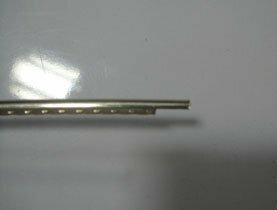 Without the micro bridges, the heat from the laser tends to make the strips twist and curl. It is easy to cleanly file and sand the micro bridges. 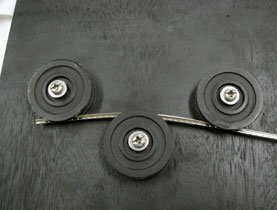 The stainless steel strips are glued in using structural epoxy specially formulated for bonding metal and wood. 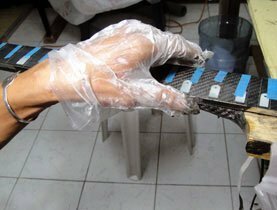 Glue is applied to the back side of the strips and the fretboard, making sure that the surfaces are sanded well for good adhesion. The binding is then placed into the routed-out groove and secured with tape making sure there are no gaps. 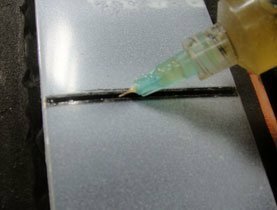 Applying epoxy specially formulated for bonding metal and wood. Securing the binding with tape and wiping off excess glue. Yet more tape to fully secure the binding and ensuring that there are no gaps. Final wrap with taut vinyl tape. Now the neck looks like a Mummy! Before gluing, the stainless steel binding strip is pre-formed for a perfect fit around the headstock’s profile. This is done manually for now. 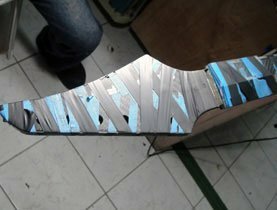 Next time I’ll definitely use a template (water-jet cut) for bending the binding into shape, both for the body and the neck and headstock. After applying glue, the same procedure used in binding the fretboard is applied. Applying epoxy on the headstock binding groove. Applying epoxy on the back side of the pre-formed binding strip. 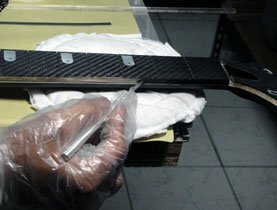 Carefully positioning the binding strip. Securing the binding with tape: A fully Mummified neck. 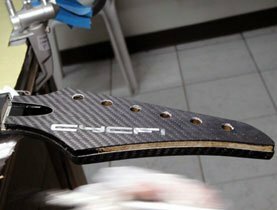 The layered carbon fiber-bamboo-epoxy fretboard has characteristics totally different from hardwood when it comes to installing the frets. With hardwood, the fibers easily grab the barbs immediately after the fret is pressed or hammered in. 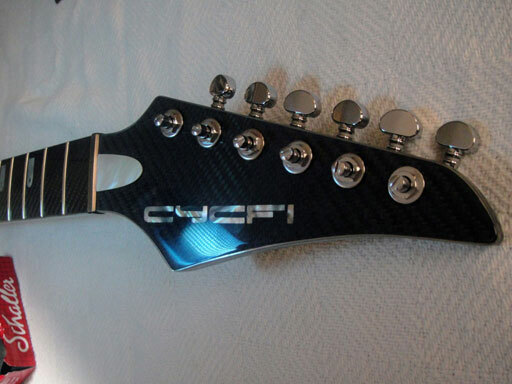 With CF-bamboo, I had difficulties using the traditional approach to fret installation. First, unlike wood, bamboo end grain splinters easily. There’s barely enough fiber cohesion to make the bamboo end grain reliably grab the fretwire barbs. While I can successfully hammer in frets into bamboo, I am not sure how reliably it will hold the frets in the long run. The carbon fiber outer layer adds to the difficulty. 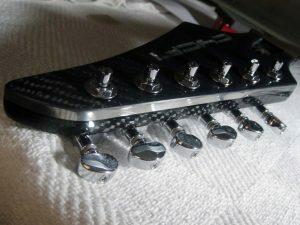 When a fretwire is forced into a tight fret slot, the carbon fiber-epoxy does not seem to sufficiently grab hold of the barbs. The epoxy tends to chip at the edges when the barbs are hammered or pressed. Post analysis shows that the material does not “heal” around the barbs enough to hold the fret in place as wood does. 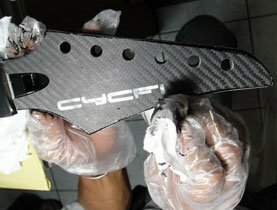 Searching around for solutions, I found this article in the web offering a different approach, cutting a wider fret slot and using epoxy to hold the fret. Even with hardwood, the author notes that the barbs often lose their grip, and the frets pop out of the slots, leading to buzzing while playing. Surely, I too had problems like this before. That is why I always glue the frets in to make sure they sit firmly in the slots. Doing so also improves the tone considerably. This StewMac article says why: Fret jobs are often too loose. 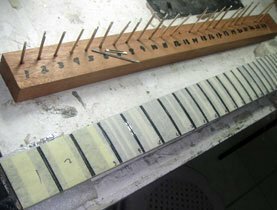 Super gluing your frets improves fret-fretboard coupling resulting in superior tone. 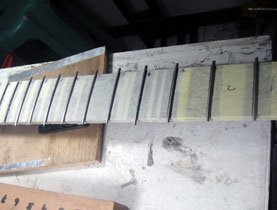 The fretwire is pre-bent to the curvature of the fretboard using a simple fret-bender jig (below). The fretwire slides in at the right and rolls through the middle, then exits the left roller bending it into the right amount of curvature. The amount of curvature does not have to be exact because the frets will be clamped in later. To accommodate the binding, the fret’s tang must be trimmed at the ends. I do not have a fret tang nipper yet, but a good end-cutter will do just fine. The end-cutter’s cutting face is ground and sanded to make it as flat as possible for a clean cut without requiring a lot of filing afterward. The fretboard slot is cut using a miter saw with kerf that is is wide enough to have the fret tang plus the barbs slip into the slot without resistance. With this method, we will not have to hammer or press the frets in. Since epoxy will hold the frets, we do not need a very tight fit. 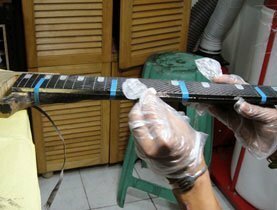 Masking tape is applied such that only the fret slots are exposed to ensure that excess epoxy does not get into the fretboard. After test-fitting the frets to see if they all fit well into each slot, epoxy is injected into the slots. 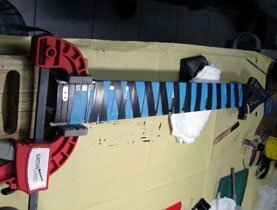 Finally, the frets are clamped using a clamping caul made from acrylic plastic with strips along the edges to press the fret ends firmly and rubber padding in the middle to evenly apply pressure. Frets placed. There's no need to hammer or press the frets. The frets slide in easily. Clamping the frets until the epoxy cures overnight. 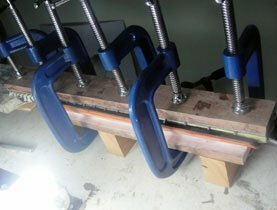 This method ensures that the frets are seated perfectly and very little effort is needed in leveling the frets. 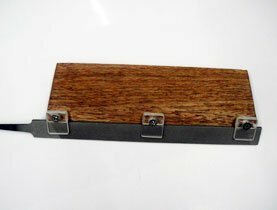 Using a perfectly flat sanding block with a 320 grit high quality sand paper, the frets are leveled starting from one end near the body, continuing towards the nut. After several gentle passes along the entire length of the fretboard, a narrow and shiny flat top should be noticeable on all frets indicating that the frets are leveled. The fret edges are rounded off using a fret crowning and burnishing tool (above). Starting with 220 grit, proceeding to 400 grit then 600 grit sandpaper held over the tool’s groove, each fret is shaped and burnished until there are no more sharp edges and the frets feel perfectly smooth. The frets are finally polished with a polishing wheel using the dremel. 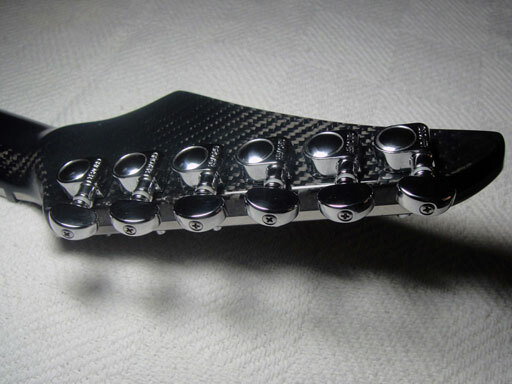 Super glue your frets to improve your tone!